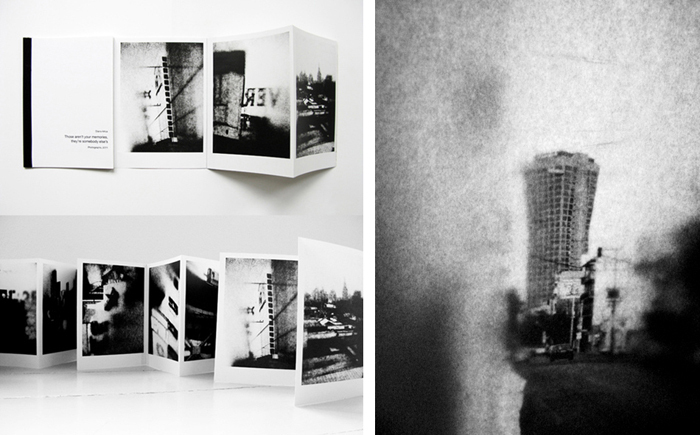 Digital print, Leporello (handmade binding), 21 x 15 cm, 2011 (Edition of 50). Digitaldruck, Leporello (handgebunden), 21 x 15 cm, 2011 (Edition von 50). The leporello contains a selection of images from the series Those aren’t your memories, they’re somebody else’s (2011) and a short text (English) written by Diana Artus. Das Leporello enthält eine Auswahl von Motiven der Serie Those aren’t your memories, they’re somebody else’s (2011) und einen Kurztext (Englisch) von Diana Artus.